(Bloomberg Opinion) -- CVS Health Corp. and Cigna Inc. spent a combined $122 billion on Aetna Inc. and Express Scripts Holding Co. in deals that linked health insurers with pharmacy benefit managers, the health-care middlemen that negotiate drug costs. Their rival Anthem Inc. thinks it can do the same thing while saving money instead of spending it. Along with fourth-quarter profit that beat analyst expectations Wednesday, Anthem said it is accelerating the launch of its in-house PBM IngenioRX to March from a previously planned start time in 2020. The company also announced higher 2019 profit guidance than analysts were expecting because it anticipates significant drug-cost savings. Investors seemed enthused, sending Anthem’s shares higher by a meaty 10 percent. Anthem has a lot to prove. Building a drug-price negotiating unit from scratch isn’t trivial, and the company is doing it on a very tight timeline. But it arguably has the right ambitions and strategy. Negotiating drug costs is all about scale. PBMs can extract rebates from drugmakers because they can nudge patients to use one similar drug over another, and make medicines trickier to obtain. The more prescriptions it can manage, the bigger the rebate it can extract. Taking a cut of these rebates has traditionally been a major source of profit for PBMs. Anthem is America’s second-largest insurer, so IngenioRx won’t be a total minnow. It’s also borrowing some of CVS’s scale, as the rival company will process claims and fill prescriptions for Ingenio for five years. But Anthem’s PBM will still be far smaller than those of its rivals, which also include UnitedHealthGroup Inc.’s Optum unit. So in order to compete and reach its very ambitious post-transition goal of $4 billion a year in annual cost savings, Anthem will have to create a very different sort of PBM. Existing PBMs have been accused of focusing on maximizing profitable drugmaker rebates at the expense of patients and overall drug costs. Anthem sued its previous PBM partner Express Scripts in 2016 for allegedly overcharging it by $3 billion a year for drugs. That touched off a messy dispute that eventually led to Anthem’s current strategic shift. Anthem wants IngenioRX to be less focused on rebates and more intent on keeping drug costs as low as possible. Starting from scratch has its advantages on that front. For one, the company doesn’t have a legacy business to transform, or a giant new company to integrate. That should give it an advantage in its effort to pioneer a new model. With CVS handling a lot of the infrastructure, Anthem can focus on integrating IngenioRx with its insurance business in order to push overall health spending lower. Anthem has already pursued cost-control strategies that an in-house PBM could push even further. One of its units was able to safely switch Medicare patients from expensive newer insulins to cheaper older drugs. Patients and the health system as a whole saved a significant amount of money. A more rebate-focused organization would be less inclined to do this. Newer insulins like Lantus are among the most heavily rebated medicines around, and have been quite profitable for PBMs. 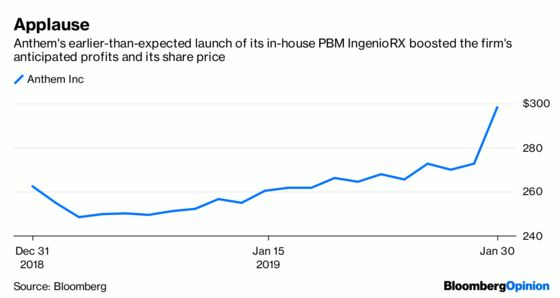 If Anthem is serious about reinventing the PBM, IngenioRx should help it pursue more of these kinds of opportunities — and, with the earlier launch, sooner than investors thought.